The WIA’s Examination System relies heavily on its Nominated Assessors, highly qualified Assessors who perform regular audit functions, conduct Special Assessments and other functions and are central to the efficiency and credibility of the system. The WIA Board had decided to recognise their contribution by awarding each of the 24 Nominated Assessors a President’s Commendation. 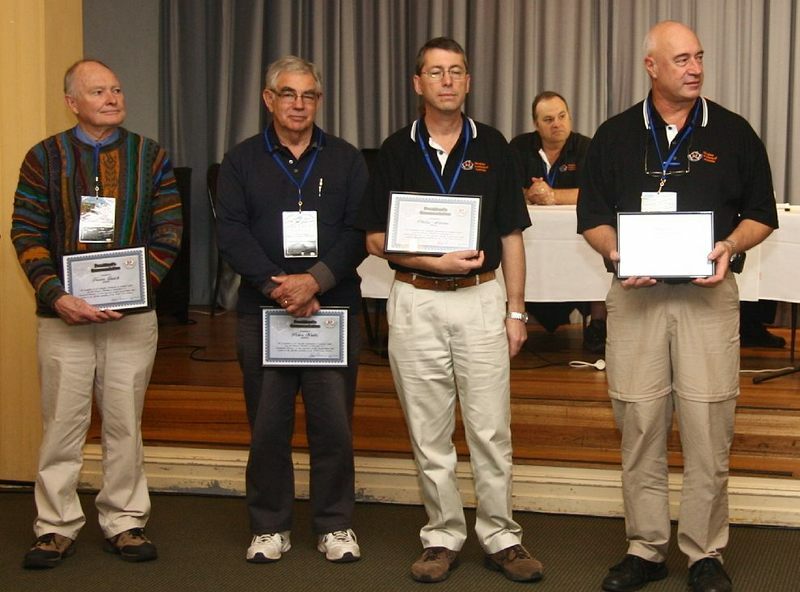 Five of the WIA’s Nominated Assessors, Terry Ryeland VK2UX, Peter Watts VK5ZFW, Trevor Quick VK5ATQ, Eric Van De Weyer VK2VE and Philip Adams VK3JNI, participated in the WIA’s Annual Conference 2012 held in Mildura on 25, 27 and 27 May 2012, and were presented with the Commendation. Terry Ryeland accepted the certificates on behalf of the other Nominated Assessors who were not present. The other Nominated Assessors are Roger Cordukes VK4CD, Peter Willmott VK3TQ, Ron Bertrand VK2DQ, Larry Lindsay VK2CLL, Peter Dowde VK7PD, Colin Pomroy VK3BLE, Craig Cook VK3CMC, Lyle Dobbs VK4LM, Trevor Connell VK8CO, Laurie Pritchard VK4BLE, Dale McCarthy VK4DMC, Tony LaMacchiaVK2BTL, Ian Ellings VK7QF, Paul Hoffmann VK5PH, Owen Clarke VK3BC, Steve Tregear VK3TSR, Scott Habgood VK2UBQ, Kathi Suminer VK6KTS and Gail Lidden-Sandford VK4ION. WIA President Michael Owen paid a warm tribute to their contribution to amateur radio and the WIA.